Since 2005 I’ve been predicting the decline of branch banking. For almost ten years I fought bankers who decried my assessment that branches would cease to be the most important channel in banking, to be replaced by far more efficient mechanisms for revenue generation and relationship. Today the discussion is increasingly resorting to a sort of desperate plea — 'but branches aren't going to die completely, are they?' No one is saying branches will grow. The UK, the US, Spain, and a host of other countries are seeing the lowest number of bank branches in decades. For the UK you’d have to go back 60 years to find lower numbers of bank branches than we have today, and 2014 saw the use of bank branches fall 6% in a single year — the biggest reduction ever. In the US banks like BofA, Chase and Wells have cut more than 15% of their branches in just the last 4 years, bring their branch levels back to that of the early 1980s. While the US has only seen declines of 1–2% per year in branch numbers, branch footprint may be a much better indicator of the waning support for branches. Wells Fargo has reduced their branch square-footage by 22% in just six years, and for BofA it’s one-fifth of their branches that have already disappeared in just the last five years. 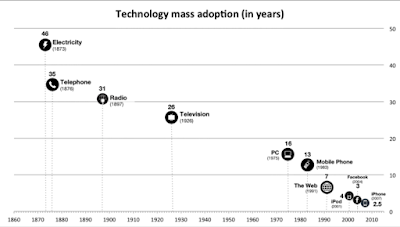 We live in a world where new technology emerges and is adopted in months today, versus the years it took previously. It’s all moving so quickly. As more and more technology is injected into our lives, we become acclimatized and just accept the increased role technology has to play. 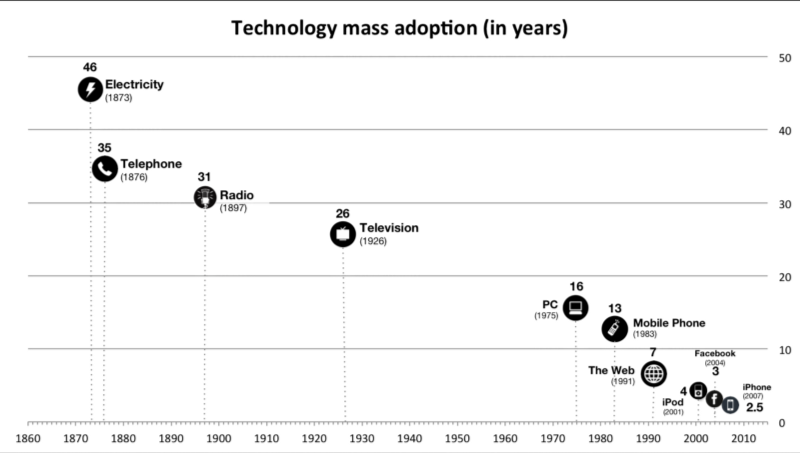 This is known as technology, adoption diffusion. For the millions of permalancers or gigging economy workers, it’s highly likely that the first time a freelancer opens a bank account will be directly in response to a new ‘gig’ or job offer — if that employer (like Uber or AirBnB) offers you a bank account as part of the sign-up process, why would you stop signing up for Uber, drive to a branch and sign a piece of paper? Uber is offering car leases to its drivers also — allowing drivers with no vehicle to sign up and get car financing backed by demand from Uber. This is what the new banking experience looks like for small business entrepreneurs. Uber is effectively doing all the sourcing for bank relationships, and has become an acquirer for bank accounts, leasing and insurance. An Uber driver has no reason to come to a bank branch for his needs today thanks to Uber’s commitment to experience design simply enabling the needs of a new driver. I really want this new iPad Pro, but I can’t afford it based on my current savings. If I use a credit card I can pay it off over the next few months. The grocery store scenario becomes an Emergency Cash credit facility — a real-time overdraft or line of credit that we deliver in one of two ways. We either preempt the cash shortage because we know the customer regularly shops at Tesco or Whole Foods and spends $600 or £300, but only has say £100 quid in his account. Either that, or we offer it in real-time when the tap of the phone to pay at the POS fails due to insufficient funds. We can eliminate rejection of a typical credit card application, because we only will offer the Emergency Cash to someone who qualifies. That’s a huge deal because between 15–30% of applicants get rejected for a credit card typically. We can allow people to put a wishlist on their phone for all the stuff they want to save for, and when they walk into a store where a wishlist item is available we can then offer a discount combined with contextualized credit offering. We can learn from previous purchase or search history and anticipate a purchase where a instantaneous line of credit option might be attractive. We can use a preferential low or zero-interest 12 month financing deal getting them to switch payment vehicles at the point-of-sale, or we can trigger an offer based on geo-location. 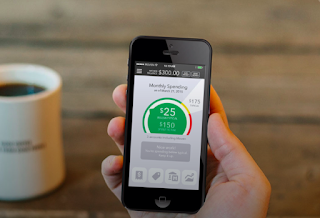 We can use iBeacons and match an offer with a customer to give a preferential deal where credit is built in. We can match savings with credit — let’s say you’ve saved $300 towards that new smartphone, we can offer the remaining $300 you’ll need in real-time as you walk in the store. The wallet in the self-driving car is analogous to the debit card you carry around in your wallet today, but there is one big difference. A human/person does not own this wallet, it is linked to the car and may or may not have multiple human owners and the identity of those owners could change frequently, but it doesn’t have to have a human owner linked at all theoretically. In today’s banking world this might be marginally possible, but only through a torturous series of contracts, declarations and identity verification processes that would essentially require all of the owners of the vehicle, and the self-driving car itself, to personally front up at a bank branch. That’s clearly and absolutely ludicrous. If you have a physical representation of a bank product (card, checkbook, bank statements, application form, sales brochure, etc) prepare for that to disappear by early next decade almost entirely.